The magnitude of the cross-Channel operation is most fully revealed in its logistic aspects. Because it was to be an amphibious operation OVERLORD's supply problems were many times magnified. Moving an attacking force and its equipment across the Channel in assault formation required, first of all, a highly coordinated staging procedure in the United Kingdom, large numbers of special craft, and meticulously detailed loading plans. Following the capture of a lodgment it involved the rapid organization of the beaches as a temporary supply base, the quick reinforcement of the forces ashore and the build-up of supplies, and the subsequent rebuilding of ports and development of lines of communications so that sustained operations of the combat forces could be properly maintained. The detailed planning for the various tasks involved did not begin until after the establishment of SHAEF and the designation of the Supreme Commander in January 1944. In the following month the plans of the various headquarters began to appear. The basic operational plan, known as the NEPTUNE Initial Joint Plan, was issued by the joint commanders--that is, the commanders of the 21 Army Group, the Allied Naval Expeditionary Force, and the Allied Expeditionary Air Forceon 1 February. First Army's plan, which constituted something of a master plan for U.S. forces in view of that organization's responsibility for all aspects of the operation, both tactical and logistical, in its early stages, appeared on 25 February. Those of its subordinate commands, V and VII Corps, were issued on 26 and 27 March respectively. On the logistical side the joint commanders' Initial Joint Plan was supplemented on 23 March by instructions known as the Joint Outline Maintenance Project. The outline of the American logistic plan was issued as the Joint Administrative Plan by the U.S. administrative staff at 21 Army Group on 19 April. This was followed on 30 April by the Advance Section plan, covering the period from D plus 15 to 41, and on 14 May by the over-all Communications Zone plan issued by the Forward Echelon. The SOS mounting plan had appeared on 20 March. In the original July 1943 outline plan of OVERLORD, which served as a basis for the later planning, it was estimated that the provision of adequate maintenance for the Allied forces in the initial stages, including the building of minimum reserves, would require a flow of supplies rising from 10,000 tons per day on D plus 3 to 15,000 tons on D plus 12, and 18,000 on D plus 18. These figures were based on an assault by three divisions, a build-up to a strength of ten divisions by D plus 5, and the landing of approximately one division per day thereafter.2 The capture of the Normandy and Brittany groups of ports was expected to insure discharge capacity sufficient to support a minimum of at least thirty divisions, and it was believed that if all the minor ports were developed this force could be considerably augmented. But frontal assaults on the ports themselves had been ruled out, and Mediterranean experience had shown that ports, even if captured shortly after the landings, would be found demolished and would be unusable for some time. The total capacity of the minor ports (Grandcamp-les-Bains, Isigny, St. Vaast-la-Hougue, Barfleur) on the front of the assault was not expected to reach 1,300 tons per day in the first two weeks. According to a later estimate, the capture of Cherbourg was not expected before D plus 14. Its capacity on opening was estimated at 1,900 tons, rising to only 3,750 tons after 30 days. In any event it was not sufficient for the maintenance of the lodgment forces. The Brittany ports would not offer a solution before D plus 60. It was clear, therefore, that the initial build-up would have to be over the beaches, and it was estimated that eighteen divisions would have to be supported over the beaches during the first month, twelve in the second, with the number gradually diminishing to none at the end of the third month as the ports developed greater and greater capacity. The planners made it clear at an early date, therefore, that unless adequate measures were taken to provide sheltered waters by artificial means the operation would be at the mercy of the weather, and that a secondary requirement existed for special berthing facilities within the sheltered area, particularly for the discharge of vehicles. They estimated that the minimum facilities required for discharge uninterrupted by weather were for a capacity of 6,000 tons per day by D plus 4-5, 9,000 tons by D plus 10-12, and 12,000 tons when fully developed on D plus 16-18. The Allied planners proposed to meet this problem by building their own harbors in the United Kingdom, towing them across the Channel, and beginning to set them up at the open beaches on the very day of the assault. While their solution was in a sense an obvious one, it was at the same time as unconventional and daring in its conception as any in the annals of military operations. Under the direction of COSSAC British engineers carried out experiments in the spring of 1943 to determine the practicability of constructing a prefabricated port, and they succeeded in building a floating pier that survived the test of a Scottish gale. But the exact form which such a port should take was not immediately determined, and the digest of OVERLORD presented by General Morgan to the Combined Chiefs of Staff at Quebec in August 1943 consequently included only the most tentative outline plan for such a harbor. The sheltered anchorage, this plan "suggested," would be formed simply by sinking nineteen blockships to form a breakwater. Berthing facilities would be provided by four pierheads, consisting of four sunken vessels, which were to be connected to the shore by "some form of pontoon equipment." The daily discharge capacity of such an installation was expected to be approximately 6,000 tons.8 The relatively simple form of the harbor thus outlined hardly suggested the myriad engineering problems that still had to be overcome, and resembled only in its barest essentials the harbors which eventually took form. The difficulties did indeed argue for themselves as Mr. Churchill predicted, for the magnitude and complexity of the task became more and more apparent. Many of the world's ports were "artificial" in that their sheltered harbors had been created by the construction of breakwaters. Cherbourg and Dover were both "made" ports in this sense. But whereas it had taken seven years to build the port of Dover in peacetime, the Allies were now faced with the problem of building a port of at least equal capacity in a matter of a few months, towing it across the Channel, and erecting it on the far shore amidst the vicissitudes of weather and battle. The plans as they were eventually worked out in fact called for the erection of two ports within fourteen days of the landings. In essence the BOMBARDON breakwater would consist of a string of huge, air-filled, cylindrical floats, moored at each end, but laced together to form a thin screen of air which was intended to break up wave action and thus provide sheltered water. The BOMBARDONS were believed to have an advantage over sunken blockships since they could be moored in comparatively deep water and thus provide sheltered water for the deeper-draft Liberties.13 Nevertheless, from the very beginning there were doubts about their effectiveness and feasibility, and they were never expected to do more than dampen wave action and provide anchorage supplementary to the main harbor for deep-draft ships. 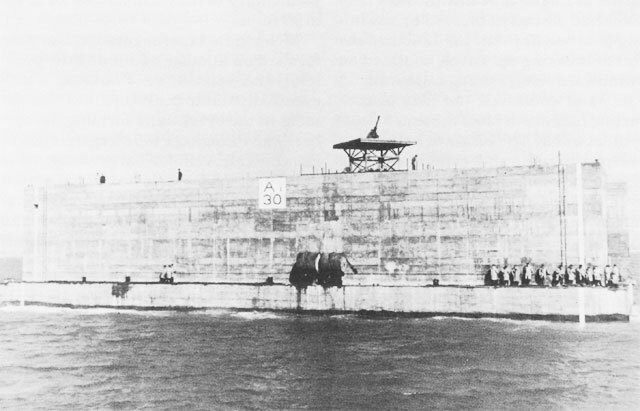 CAISSONS, used for MULBERRY breakwater, sunken in position off the beaches, above, and afloat, below. Experimentation on the second vital portion of the harbor--the berthing and unloading facilities within the breakwater--had begun somewhat earlier in response to the Prime Minister's directive in 1942. This was fortunate, for the engineer problems involved proved far more complex than those met in the construction of the PHOENIXES. Once again the gradient of the beaches and tidal conditions largely determined the requirement. Low tide along the Normandy coast uncovered as much as a quarter of a mile of beach, and it was necessary to go out another half mile to reach water of sufficient depth--12 to 18 feet--for the discharge of coasters. The equipment developed to bridge this gap consisted of two basic components: pierheads, at which vessels were to berth and unload; and piers or roadways which connected the pierheads with the shore. Both were designed mainly by the British and involved an ingenious piece of engineering. The Lobnitz pierhead, as it was called, was an awesome-looking steel structure 200 feet long, 60 feet wide, and 10 feet high, weighing upwards of 1,500 tons. At each corner of the structure was a 4 x 4-foot spud leg 90 feet high, the height of which could be adjusted independently by means of winches located between the decks. These spud legs could be retracted during the towing of the structure. Once the pierhead was placed in position the legs were lowered, their splay feet digging into the sea floor to steady the structure, and their height was then adjusted to keep the pierhead at uniform height above water at all stages of the tide. The Lobnitz pierheads were intended to provide the principal unloading facilities for LCT's and LST's that were not beached and for coasters. They were so designed that any number could be linked together to form an extended berth. To connect pierheads with the shore a flexible steel roadway, known as the WHALE, was developed. The WHALE pier consisted essentially of 80-foot sections of steel bridging, linked together by telescopic spans which gave it the needed flexibility to accommodate itself to wave action, the entire WHALE structure resting on concrete and steel pontons known as "beetles." At low tide the sections near the shore would come to rest on the sand. of its various components. Because experimentation had not yet produced conclusive solutions to many problems, the plan which COSSAC submitted at Quebec in August was necessarily sketchy and vague. Nevertheless the Combined Administrative Committee of the Combined Chiefs of Staff concluded at that time that the construction of artificial harbors was definitely feasible, and approved the project in its general outline. Early in September it rejected the bubble breakwater idea, but recommended continued experimentation with all the other proposed solutions--BOMBARDONS, PHOENIXES, and sunken and floating ships--and urged the immediate construction of PHOENIXES and BOMBARDONS without awaiting the completion of trials and prototypes of the latter. These projects were given the highest priority for labor, equipment, shipping space, and supplies, and construction of the first units now began in earnest. The respective spheres of responsibility of the United States and Britain with regard to experimentation and construction were also defined in September. By far the largest portion of the work had to be carried out in the United Kingdom, and the British consequently assumed major responsibility for the design, testing, and construction of the PHOENIXES, BOMBARDONS, pierheads, and WHALE bridging. ships were properly planted, blowing holes below the water line so that they would sink rapidly.198 These shallow-water GOOSEBERRIES would provide early protection for the large number of tugs, ferries, DUKWs, and landing craft plying between the ships and beaches and for the craft which had been beached. 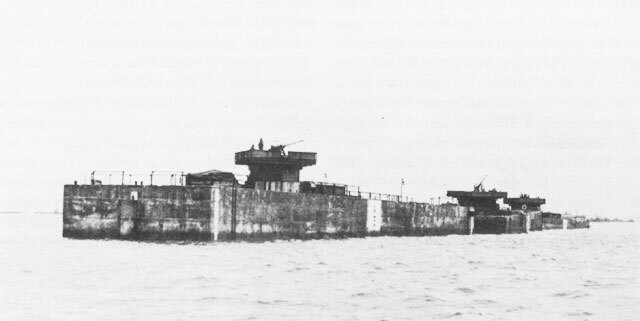 At OMAHA and Arromanches they would tie in with the PHOENIXES to form a longer breakwater enclosing the entire harbor.20 The sheltered area formed by the breakwater at MULBERRY A was to provide a harbor of about two square miles, with moorings for 7 Liberty ships, 5 large coasters, and 7 medium coasters. Both the British and American MULBERRIES eventually also included a row of BOMBARDONS, despite continued misgivings as to their probable effectiveness.23 These ungainly looking floats were to be placed about 5,000 feet seaward of the high-water mark to break the swell and form an additional deepwater anchorage for the discharge of Liberty ships. The UTAH Beach installation was to be much less elaborate. It was to have only a GOOSEBERRY breakwater, formed by sinking ten blockships beginning on D plus 1, and the two ponton causeways. Over-all command of both MULBERRIES was given to Rear Adm. William Tennant (British). On the U.S. side Capt. A. Dayton Clark was placed in command of MULBERRY A, organized as Naval Task Force 127.1, but usually referred to as Force MULBERRY. Brigadier Sir Harold Wernher was designated to co-ordinate the work of the War Office and the civilian Ministries of Labour and Supply in the construction of the many components of the ports. would be needed for the task and that they would be occupied a full three months. While the artificial ports represented one of the most ingenious engineering accomplishments and one of the invasion's most expensive investments of resources, they were to remain largely untried expedients and therefore unknown quantities until they were subjected to the twin tests of battle and weather off the Normandy coast. Of equal importance to the logistic preparations for the operation was the organization of the beachs, across which all equipment and supplies would have to pass in the initial stages regardless of whether they were discharged at the pierheads and brought ashore via the roadways or were discharged from landing craft at the water's edge. the first continental lines of communications. The initial organization of these areas was therefore a vital preliminary step in the transition to the normal administrative organization provided by the Communications Zone. Responsibility for developing and operating the first supply installations on the far shore was assigned to the engineer special brigades: the 1st Engineer Special Brigade at UTAH, and the Provisional Engineer Special Brigade Group, consisting principally of the 5th and 6th Brigades and the 11th Port,34 at Omaha where the MULBERRY was to be located. As attachments to the First Army in the first stages of the operation these units were required to prepare plans based on the engineer special brigade annex to the First Army plan, and the brigades accordingly carried out detailed planning for the early organization of the beach areas. In the next chapter more will be said about the origins and development of the engineer special brigades. These organizations, mothered by the necessities of the frequently recurring amphibious operations of World War II, were specially trained and equipped to handle the technical organization of the beaches. As outlined by a First Army operations memorandum, their general mission was "to regulate and facilitate the landing and movement of personnel and equipment on and over the beach to assembly areas and vehicle parks, to unload cargo ships, to move and receive supplies into beach dumps, to select, organize, and operate beach dumps, to establish and maintain communications, and to evacuate casualties and prisoners of war over the beach to ships and craft. "35 In short, it was their duty to insure the continuous movement of personnel, vehicles, and supplies across the beaches in support of a landing operation. By "the beaches" was normally meant an area known as the "beach maintenance area," which included the beach, the first segregated supply dumps inland, and the connecting road net, an area which usually did not extend more than three miles inland. 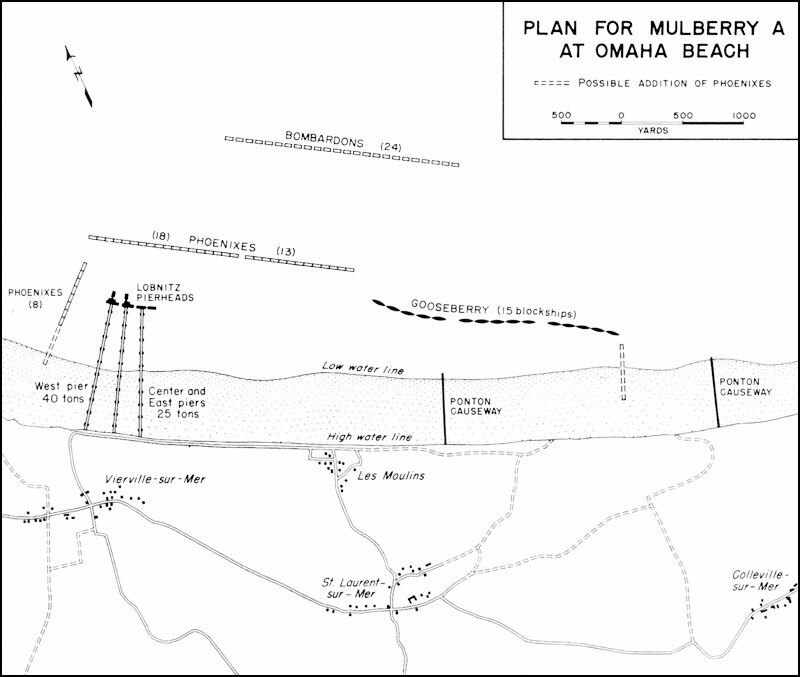 At OMAHA the beach maintenance area included MULBERRY A and the minor ports in the vicinity. area for units crossing the beach; regulating and facilitating the movement of unit personnel and equipment across the beach and insuring the rapid movement of supplies into dumps; selecting, Organizing, and operating beach dumps for initial reception and issue of supplies; selecting, organizing, and operating beach maintenance area dumps until relieved by the army; maintaining records showing organizations, materials, and supplies which had been landed; providing for decontamination of gassed areas in the beach maintenance area; maintaining an information center for units landing; operating emergency motor maintenance service to assist vehicles and equipment damaged or stranded in landing and requiring de-waterproofing assistance; providing local security for the beach maintenance area; and co-ordinating offshore unloading activities. Many of these tasks obviously called for troops other than engineers. In this respect the name "engineer special brigade" is misleading, for while the core of the brigade consisted of engineer combat battalions, each brigade normally contained a body of Transportation Corps troops, such as amphibian truck companies and port companies, exceeding the size of the engineer component, plus quartermaster service and railhead companies, and ordnance, medical, military police, chemical, and signal troops. In addition, depending on its mission, each brigade was augmented by the attachment of a host of other units and special detachments such as bomb disposal squads, naval beach units, maintenance and repair companies, fire-fighting platoons, and surgical teams, which might raise its total strength to 15,000 or 20,000 men. The engineer special brigade was a hybrid organization, therefore, without standard composition. But it was exactly this feature which gave it the desired flexibility and permitted it to be tailored to any task in an amphibious operation. Portions of the brigades were scheduled to follow closely on the heels of the initial assault waves. Within the first two hours of the landings they were expected to complete the initial reconnaissance and beach marking preliminary to the development of the beaches. In that period advance parties of engineer shore companies, signal teams, and naval units were to come ashore, survey beach and offshore approaches, plan the layout of beaches for landing points, roadways, and exits, install ship-to-shore signal stations, and erect beach markers. Within the next two hours additional elements of the brigade would arrive, remove mines and beach obstacles, decontaminate beach areas, lay beach roadways, complete exits, establish collecting and clearing stations, start controlling traffic, build stockades for the control of prisoners of war, assist stranded craft, control boat traffic, reconnoiter initial dump areas, and establish motor parks for first aid to water-stalled vehicles. By the end of the first day the brigade was to have established the brigade command post, a signal system, and assembly areas for troops, sign-posted all routes to the dumps, repaired roadways to the dumps, opened beach exits, organized antiaircraft defense, organized initial dumps for the receipt, sorting, stacking, inventory, and issue of supplies, and to have started unloading supplies. Initial beach dumps were to be in full operation by the end of the first day. Within the next few days supplies were to be routed to new dumps established farther inland in the beach maintenance area. The brigades were thus destined to play an essential role in initiating the development of the far-shore logistic structure. Since they were to land in the first hours of the invasion, while the beaches were still under fire, they were expected to perform both combat and service missions. That they were aware of their dual role is indicated by their reference to themselves as "the troops which SOS considers combat, and the combat troops consider SOS." best combination of features required for an assaulting force, including proximity to the port of Cherbourg, but also because it lay between two other groups of ports--the Seine and Brittany groups--permitting operations to develop toward one or the other. The OVERLORD planners actually expected to rely completely on the Normandy and Brittany groups to develop the required discharge capacity for the Allied forces to D plus 90, and their plans for the rehabilitation of the ports in the lodgment area were made accordingly. Operating the continental ports was to be a Transportation Corps function, restoring them was the responsibility of the Corps of Engineers. In the final Communications Zone plan this reconstruction work was given a priority second only to the development of beach installations.38 Planning for this task fell mainly to the Construction Division of the Office of the Chief Engineer, ETOUSA. U.S. participation with the British in this planning for port salvage and repair began in July 1942, immediately after the activation of the European theater, when American representatives attended meetings of the ROUNDUP Administrative Planning Staff. General Davison, chief engineer of the theater, suggested the magnitude of the task of rehabilitating the European ports when he said that it could "best be visualized by imagining what would have to be done to place back in operation the ports of Baltimore, Md., Portland, Me., Portland, Oreg., Mobile, Ala., and Savannah, Ga., plus ten smaller shallow-draft U.S. ports, assuming that these ports had been bombed effectively for two years by the R. A. F., then demolished and blocked to the best of the ability of German Engineer troops. "39 He recommended at that time the creation of specially organized and equipped engineer port construction companies reinforced by engineer general service regiments, and suggested that they be organized with personnel from large U.S. construction firms in the same way that American railways sponsored railway operating battalions. These proposals were forwarded to the War Department, and the theater's needs in this respect were later met by the formation of units substantially along these lines. Shortly thereafter preliminary studies were undertaken of the problems involved in reconstructing particular continental ports. No operational plan was available at this early date, and the North African invasion intervened to detract somewhat from planning for continental operations. But the ROUNDUP planning staff continued its work throughout the winter of 1942, and early in 1943 a subcommittee on port capacities in northwest Europe was organized under the chairmanship of a British officer, Brigadier Bruce G. White. This committee eventually extended its investigations to the ports along the entire coast of northwest Europe from the Netherlands to the Spanish border. The actual work of rehabilitating the captured ports was to be assigned to organizations specifically designed for this purpose--port construction and repair groups, or PC&R groups. The headquarters and headquarters companies of these groups comprised a nucleus of specialists trained in marine construction, and included a pool of heavy construction equipment together with operators. This nucleus was to be supplemented by engineer service troops and civilians to provide the necessary labor and, according to need, by dump truck companies, port repair ships, and dredges. The port construction and repair group with its attachments thus constituted a task group, tailored for the specialized mission of restoring ports, much as the engineer special brigades were organized for the task of developing the beaches. The equipment requirements for port reconstruction were difficult to estimate in advance, and little attempt was made to analyze and determine the requirements for individual ports. Instead a stockpile of materials was created, and estimates were made of the necessary repair and construction materials for a fixed length of quay, assuming a certain degree of destruction. These estimates were used to develop standard methods of repair that would be generally applicable to all types of repair work in French ports. Apart from an initial representative list of basic materials and equipment accompanying the repair groups, reconstruction materials were to be ordered to the Continent after the capture and reconnaissance of each port. the first priority in development, and the plans for its six ports plus St. Malo were worked out in much greater detail before D Day. Of these seven ports all except Cherbourg were tidal, drying out completely at low water. Most of them had a mud- or sand-bottomed basin and two or three quays which were entirely tidal, and at high water they could accommodate only vessels drawing a maximum of thirteen or fourteen feet.44 In this respect they were typical of the French ports along the English Channel and the Bay of Biscay, where tide and weather conditions had required the construction of massive breakwaters, locked basins, and channels, in contrast with ports in the United States where such elaborate paraphernalia were unnecessary. Although the movement of craft into and out of these "minor" ports would be restricted by the tide, they at least offered some protection from stormy weather, and the desperate need for discharge capacity in the early phases appeared to warrant bringing them into use. The total discharge capacity of these six minor ports was not great. At D plus 30 it was scheduled to be 4,500 tons per day. At D plus 60, with the small Brittany port of Lorient added, they were to develop a capacity of 7,700 tons, and at D plus 90, 10,650 tons.46 As for clearance facilities, all the ports had good road connections, but only Granville had first-class rail clearance. All the other minor ports would have to be cleared by motor transport. Since the minor ports possessed only limited capacities and were rather uneconomical to operate, their development was never intended to be more than a stop-gap measure designed to meet a portion of the discharge requirements in the period before the full potential of the larger ports was realized. Plans for their restoration were completely overshadowed by those made for Cherbourg. This port was expected to handle 6,000 tons at D plus 30, 7,000 at D plus 60, and 8,000 at D plus 90, and was to exceed in capacity the combined tonnage of the six minor ports throughout the first 60 days. Even Cherbourg was to have but a temporary importance for U.S. forces, for plans were tentatively made to turn the port over to the British after a short time, and to route the major portion of American cargo through the Brittany ports and later through others farther up the Channel. Cherbourg, however, played a wholly unexpected role in the support of U.S. forces and eventually ranked as one of the big three of the continental ports. Digue de Querqueville, I; Naval Arsenal, 2; Nouvelle Plage, 3.
facilities, most of which were concentrated along the western and southern sides. 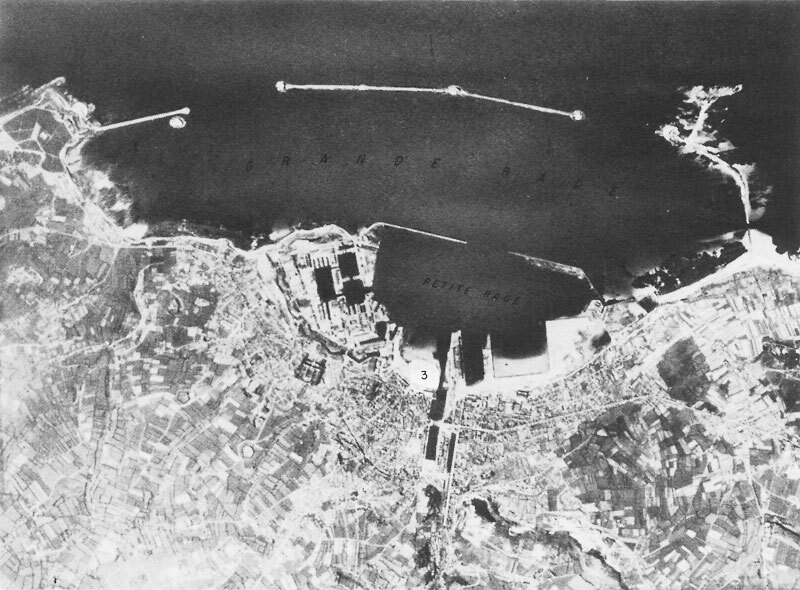 The entire western side of the port was occupied by the great Naval Arsenal, consisting of repair shops, drydocks, and maintenance facilities grouped around its three basins--the Avant Port, Bassin Charles X, and Bassin Napoléon III--and including additional berthing facilities at the Quai Homet and along the Digue du Homet, the western jetty enclosing the inner harbor. This area alone was expected to provide discharge facilities for 5 Liberty ships, 2 train ferries, 24 coasters, and 2 colliers. Just south of the main arsenal installation lay the seaplane base and its three small basins--the Bassin des Subsistences, Avant Port, and Port de l'Onglet--which were expected to provide berths for 13 coasters. Adjoining this area to the southeast was a broad bathing beach known as the Nouvelle Plage, believed to be ideal for unloading vehicles from LST's. Immediately to the east of this beach and directly in the center of the harbor lay the entrance channel to the Port de Commerce, consisting of two basins (the Avant Port de Commerce and the Bassin à Flot) which jutted deeply into the heart of the city. These two basins were planned to accommodate 17 coasters and 2 LST's with tracks for the discharge of railway rolling stock. Dominating the entrance to these basins was the large Darse Transatlantique, the deepest portion of the harbor, where the Quai de France and the Quai de Normandie provided berthing for large passenger liners, and where discharge facilities were now to be provided for 7 Liberty ships, 2 LST's carrying rolling stock, and a train ferry. A large tidal basin in the southeast corner of the port was believed to be suitable for the reception of additional vehicle-carrying LST's. schedule for initial quay repair jobs and examine locations where initial cargo discharge from DUKWs, barges, and LST's could begin. The actual rehabilitation work was to begin the second day after capture (D plus 10), early priority being assigned to such projects as debris clearance from the Quai Homet area, preparation of LST landing sites on the Nouvelle Plage, and construction of a tanker berth at the Digue de Querqueville on the west side of the outer harbor. By D plus 11 progress on these first projects was expected to be sufficient to permit the unloading of about 1,600 tons of cargo by a combination of DUKWs and barges unloading from Liberties and coasters, the unloading of at least one docked coaster direct to a usable quay, and the discharge of 840 vehicles per day from LST's at the Nouvelle Plage. By the fourth day the Allies planned to boost unloading to about 3,800 tons, and by the tenth to about 5,000 tons. The great bulk of this discharge was to be carried on by DUKWs and barges working Liberty ships and coasters at anchor. In fact, only one coaster berth and four Liberty berths were expected to be in use at the end of the first month of operations, and direct ship-to-shore discharge consequently was expected to account for only a fraction of total discharge in these early weeks. Some conception of the minute detail and scope of preparations for the rehabilitation of the ports can be gained from a glance at the engineer reconstruction plans. In sheer bulk the ADSEC engineer plan outweighed that of all other services combined, comprising two thick volumes of data on the Normandy ports. These included an analysis of their facilities, a schedule of reconstruction, and a detailed catalogue of equipment and material needs. The length and width of every quay, the depth of water alongside, the nature of the harbor bottom, the number and types of cranes, the capacities of berths, road and rail clearance facilities, all were set down in inclosures to the plan. Next, every reconstruction project was defined and given a priority, and units were phased in to undertake these jobs in prescribed order on specific days. On the basis of the above data, the ADSEC planners estimated the type and number of craft that could be accommodated and the tonnage discharge targets that should be met on each day by the beaching of vessels, by DUKW, coaster, and barge discharge, and by direct unloading from either coasters or deep-draft ships. In meticulous detail they drew up lists of materials needed in the reconstruction, specifying the exact quantities of hundreds of items from bolts and nails, ax handles, valves, washers, and turnbuckles in quantities weighing only a few pounds, to heavy hoists, tractors, sandbags, and cement, weighing many tons. The ADSEC plan scheduled twenty-one projects to be started by D plus 31, establishing the days and priority in which they were to be undertaken, specifying the crews available for each job, and the time in which they were to be completed. While it was unlikely that this clocklike schedule would be followed to the minute in view of the many unforeseeable circumstances, plans nevertheless had to be made on the basis of the most optimistic forecast of tactical progress in order that logistical support should not fall short of requirements. allotted included 1 major port headquarters (the 11th), 10 port battalion headquarters, 48 port companies, 1 harbor craft service company, 7 quartermaster truck companies, and 19 amphibian truck companies. Cherbourg was assigned 1 port headquarters (the 4th), 6 port battalion headquarters, 20 port companies, 2 harbor craft service companies, 1 port marine maintenance company, and 4 amphibian truck companies. Floating and nonfloating equipment needs at the beaches included 950 DUKWs, 16 tugs, 7 sea mules, 66 barges, and varying numbers of cranes, tractors, trailers, and various types of boats. Cherbourg was to be furnished 200 DUKWs, 176 barges, 38 tugs, 11 sea mules, a floating drydock, and various crane barges, landing stages, and boats. These items were solely for harbor use. On shore there were additional requirements for 69 cranes of various sizes and types, 30 derricks, plus conveyors, trailers, and tractors.52 In addition to these elaborate plans for the development of the port's discharge capacity the Communications Zone plan scheduled the introduction of railway equipment to meet the corollary requirement of developing Cherbourg's clearance facilities. tide providing berths for five Liberty ships at the edge of the deepwater anchorage. Two fixed-construction causeways were to extend across the tidal flat from the shore to the landing stage. In addition a floating pier, constructed of naval lighterage pontons, was planned south of the landing stage, and an existing mole with rail connections farther north was to be extended into deep water to make possible the handling of heavy lifts. These facilities were expected to give the port a capacity of 10,000 tons per day. In March and April the entire problem had been restudied with a view toward making up the recognized deficiencies. The substitution of the CHASTITY project for St. Nazaire and the other minor Brittany ports was a partial solution. But the Brittany ports were not scheduled to come into use until after D plus 50. Measures were also taken in March to prolong the life of the MULBERRIES. In addition, estimates were revised, first, of the time required to capture the ports, and second, of the time required to open the ports. At the same time the estimates of their tonnage capacities were increased. Cherbourg's maximum capacity, for example, was boosted from 5,000 to 8,000 tons. Its capture was more optimistically scheduled for D plus 8 instead of D plus 10, and the time required for its opening changed from ten to three days. Cherbourg was thus scheduled to receive cargo on D plus 11 instead of D plus 20, and in greater volume. As a result of similar alterations in the schedule for the other ports the planned tonnages of the Normandy ports were increased by over 4,000 tons per day. Unfortunately the anxieties and uncertainties attending port planning were not to end with the establishment of a lodgment on the Continent. Port discharge was to become one of the most frustrating limiting factors of the continental operation and was to persist as a major logistic problem for fully six months after the landings. Closely related to the problem of port and beach capacities was the matter of the continental troop build-up. The OVERLORD operational plan prescribed that in the American zone the assault and immediate follow-up would consist of three infantry and two airborne divisions, together with the necessary supporting troops, and that additional preloaded forces were to land on D plus 1 and 2. The preloaded forces were organized as follows: Forces O (for OMAHA) and U (for UTAH), approximately equal in size, constituted the initial assault forces, and together totaled about 60,000 men and 6,800 vehicles.59 They were to be loaded in ships and craft along the coast of southern England and were to land on the French beaches on the first tide. Force B, with a strength of about 26,500 men and 4,400 vehicles, formed a follow-up force with various reinforcement units for the V Corps in the OMAHA Beach area. This force was to be assault-loaded in ships and craft in the southwestern English ports and was to land on the second tide of D Day and and on D plus 1. In addition, a preloaded build-up force of 43,500 men and 6,000 vehicles, containing units for both beaches, was to embark in the Bristol Channel ports and cross the Channel on D plus 1 and 2. A total of more than 130,000 men and 17,300 vehicles was thus loaded in all the available ships and craft before D Day. month, the majority of them directly from the United States. Determining the make-up of the force and the order in which the various units should be phased into the Normandy bridgehead posed another problem. The composition of the build-up as between field, air, and service forces is shown in the schedule tabulated at the top of this page.61 It can be seen that the most rapid buildup of divisions was to occur in the first two weeks of the operation, and that the field forces as a whole made up 75 to 80 percent of the assault and initial build-up forces through D plus 15.62 It was natural that the assault and initial build-up forces should be composed primarily of combat units, for the first mission was to secure a beachhead. The field forces, consequently, were allotted the preponderant share of the available lift in the early stages, and whatever service forces other than those organic to the divisions crossed the Channel in these first days, such as the units with the engineer special brigades, were attached to the assaulting corps. While the prior claims of the field forces in the early stages were fully recognized, it was obviously desirable that service forces should be introduced as early as possible. The need for them would mount rapidly as ports were captured and as tactical progress required the development of the lines of communications. In allocating the available lift there arose the ever-recurring argument as to the proper ratios of combat and service troops. One facet of this eternal conflict has already been seen in the competition between ground and service forces for larger shares of the theater troop basis. In view of shipping limitations, the competition was bound to continue in the allotment of lift and in the preparation of the build-up priority lists. tonnages and the number of supply items; the growing destructiveness of modern warfare, toward which the heavy bomber had made a large contribution, made it necessary to rebuild a country's lines of communications as armies moved along. The competition between combat and service troops for the available lift was pointedly illustrated in January 1944 when the Supreme Command was considering a major alteration in the OVERLORD plan that provided for an enlargement of both the assault area and the size of the attacking forces. One of the officers at a Supreme Commander's conference at that time expressed apprehension lest, with the changes, the service forces would also request an increase in strength in the early stages. He believed such demands should be resisted. A representative of the service forces thought it necessary to re-emphasize that the requirements for service elements in the early stages must not be underestimated nor neglected. General Eisenhower recognized immediately that with a wider bridgehead the Allies would also have a wider road for the supply of the operation, and he thought it was logical that the strengthening of the assault forces should be accompanied by a corresponding strengthening of the administrative components.64 Whatever force was placed on the Continent had to be a balanced one, and any attempt to introduce excessive combat forces without an adequate build-up of service forces and an increase in supply build-up capacity would reduce the division slice and lessen the support capabilities of the Communications Zone. In the final plans a force of 340,000 COMZ troops as compared with about 665,000 field force troops was scheduled to be built up in the first three months. The proportion of service troop strength was actually higher, since the field forces themselves contained substantial numbers of organic service units. In the first days COMZ troops were to comprise only 16 to 18 percent of the total force landed. The build-up of service troops was to be stepped up in the second week and would comprise 21 percent of the total on D plus 15, rising to 26 percent on D plus 25 and 30 percent on D plus 40. On the eve of the invasion the troop basis provided for a division slice of 40,000 men, of which 10,000 or 25 percent comprised the COMZ portion. Whether such priority would actually be given depended largely on the course of operations. Meanwhile, the rate at which both combat and service units were to be shipped to the far shore was at least tentatively prescribed in what were known as Buildup Priority Lists. The U.S. forces in the OVERLORD operation consisted of several thousand units and detachments of varying size, many units being broken into two or more echelons for the movement across the Channel. Scheduling their shipment in the order best designed to meet both tactical and logistical needs was itself a vital element of the operational plan. To prepare these lists, essentially a responsibility of the tactical commands, was a laborious task involving many considerations. The basic limiting factor governing the speed at which U.S. forces could be built up on the Continent was the available lift. Estimates on the course of operations, particularly the rate of advance, further determined the types and proportions of combat and supporting troops required on the far shore. Similarly, a forecast of areas progressively to be occupied by U.S. forces in France was a factor in determining the number of advance airfields to be established by the air forces. These estimates, by indicating the number of troops requiring logistical support, provided a basis for calculating the buildup of service units. A number of other considerations bore heavily: the initial lack of port and rail facilities called for heavy reinforcement in Engineer and Transportation Corps units; the initially independent operations of the V and VII Corps in the assault necessitated that sizable service elements be assigned to the corps in the early stages; and the threat of enemy air attack against large forces concentrated in a small area required a large number of antiaircraft units and the early establishment of advance airfields. Many compromises eventually had to be made. In practice the field force, air force, and COMZ planners were allotted a proportion of the expected daily lift and were directed to name specifically the troop units which they desired included in each day's build-up. Finally, these requirements were arranged in a single list for priority of embarkation and movement. all units or portions of units which were to move separately, their personnel and vehicle strength, and their assignment. The preparation of the lists involved some of the most agonizingly detailed co-ordination of the OVERLORD planning, for there were endless changes in the designation, type, number, and composition of units. While the First Army list was firm early in April, it was not until much later that agreement with the various headquarters involved was reached on the 1st Army Group list. Late in May the receipt of information concerning added enemy strength in the Cotentin set off a chain reaction that illustrated how last-minute changes in tactical plans could affect all aspects of logistic arrangements. 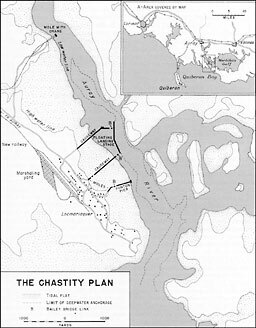 Anticipating increased resistance in the VII Corps sector, the planners concluded that progress would probably be slower, that Cherbourg would be captured later than originally estimated, and that there would be a delay in developing the discharge capacity of UTAH Beach to the maximum. It was all the more imperative that communications between the two corps be established at an early date. The expected delay in the capture of Cherbourg made it possible to phase back by five to seven days the units scheduled to open that port. This in turn freed sufficient lift to permit the earlier transfer of an additional infantry division. To meet the expected need for additional combat strength, therefore, the First Army commander directed that the service troops in question be phased back and that another division (the 79th) be brought in over UTAH Beach at about D plus 8. The Advance Section opposed the change, and warned that the resultant delays in the reconstruction of Cherbourg and of the railways might seriously affect its ability to support the operation.66 The change was made, nevertheless, and proved to be but the first of many alterations in the build-up schedule. The movement of replacements and the establishment of a replacement system on the Continent constituted an essential part of the OVERLORD build-up plan. The responsibility for drafting such a plan rested with the Replacement System, a separate theater command headed by Col. Walter G. Layman. The lack of a plan as late as the end of April caused some apprehension in higher headquarters.68 But a plan to guide the movement of replacements and replacement installations to the Continent was published in mid-May as an annex to the Communications Zone plan. It provided for the transfer of more than 200,000 replacements to the Continent in the first ninety days. The replacement plan followed the three-phase scheme which was common to all OVERLORD planning. During Phase I (D to D plus 14) the replacement system on the Continent was to be operated by First Army. Three separate replacement battalions were to be attached to First Army initially, one in support of each corps (V, VII, and XIX), to handle the processing of replacements requisitioned in advance. On about D plus 10 a replacement depot with two additional battalions was to cross to the Continent and assume control of all five battalions operating with the First Army. An operational reserve of 5,000 replacements was to be shipped to the depot immediately from the replacement pool in the United Kingdom.69 In Phase II (D plus 15 to 41) the over-all control of the replacement system was to be exercised by the Advance Section. In this period an additional depot with four battalions was to be established on the Continent; two battalions were to be brought in for the support of the Third Army; and an armored force replacement battalion was to be established to form the nucleus of an armored force depot. The phasing in of the remaining replacement installations, including three more depots with eleven battalions, was to be completed in Phase III (D plus 42 to 90). All depots were not of the same type, nor in direct support of the armies. Some served as replacement stockage depots, some as reception depots, and others were for casuals or for training.70 All were to move to the Continent according to a prearranged schedule, although this was subject to change as were all build-up plans. Long before D Day the theater worked out a requisitioning procedure for the normal operation of the replacement system. But this procedure was not counted on to fulfill the needs of the initial stages of the invasion, for it was believed to be incapable of responding quickly enough to the demands which heavy initial casualties were expected to cause. Large numbers of replacements would be needed quickly, and the existence of a water barrier between the stockage pools and requesting units, causing both transportation and communications difficulties, was expected to create a great handicap to the expeditious filling of requisitions. Even the establishment of three replacement battalions within the first week was not expected to meet the earliest demands. Two methods were devised to meet the problem in the first fifteen days. To provide for replacement needs in the first five days of the operation an initial overstrength of 2,500 men was authorized each assault division, and proportional overstrengths were also authorized the engineer special brigades. These overstrength increments were attached to the units in the United Kingdom and underwent training with them. At invasion time they were held in readiness on the near shore to be sent forward on a prearranged schedule. Beginning on D plus 5, when the overstrengths were expected to be exhausted, and continuing through D plus 14, replacements were to be provided in "packages" made up in advance. Each package was to contain 250 men organized into platoons and squads and commanded by officers and noncommissioned officers who were also replacements. Members of the ETOUSA adjutant general's staff had conceived the idea, proposing that the packages be formed by arm or service, and that their make-up be based on casualty experience in North Africa. An infantry package, for example, would consist entirely of infantrymen of varying specialties, such as riflemen, cannon crewmen, mechanics, antitank gunners, heavy weapons crewmen, and so on. To stock even approximately correct numbers of each type of replacement before D Day was a difficult task, for it depended entirely on the accuracy of loss estimates. Estimates had to be made several months ahead of actual need so that the War Department could plan its training program sufficiently in advance and establish the necessary shipping priorities. Initially the War Department authorized a specific allowance in the theater troop basis in order that an adequate stockage of replacements might be on hand for the invasion. On the basis of estimated losses from all causes in the first sixty days the theater was permitted to build up its pool of replacements to 84,110 men by 1 June 1944. On that date the Replacement System actually had a total of 76,026 men plus the 5,300 allocated to overstrength increments for assault units, making a total of 81,326.
for OVERLORD in January 1944. Before submitting his figures he first had to estimate casualties--a process that involved some complex calculations. The average losses of any one campaign could not be used, for example, since casualty rates fluctuated in the course of operations, with the heaviest losses occurring in the assault period. For purposes of calculation the first 150 days of the operation were therefore divided into five thirty-day periods. Among the factors involved in estimating casualty rates in these phases were the strength of the enemy and estimates of his capabilities, the type of action expected, the terrain and weather, the probable number of drownings in the first days, and the expected nonbattle casualties. Additional estimates had to be made of the percentage of men that would be killed, wounded, and missing, and of the percentage of wounded that could be expected to return to duty in 30, 60, 90, or 120 days. Finally, it was necessary to estimate the need for replacements in each branch and in each occupational specialty. Studies made in October 1943 concluded that 62 percent of all replacements would have to be infantrymen. In February 1944 this figure was raised to 64.3 percent, and shortly before D Day it was again raised.72 Obviously the problem of determining personnel requirements was full of unpredictables, and only the experience of actual combat would test the validity of these calculations. directives and initiated a conservation program that stressed the economical use of manpower and extensive utilization of limited-assignment personnel. The War Department again applied the spurs to this program in April, and in the following month both the theater and the zone of interior took further economy measures. In May all SOS replacements were frozen in the 10th Replacement Depot in the United Kingdom in order to screen out men suitable for duty with the field forces. In addition the theater commander ordered that all physically qualified infantry officers and enlisted men in noninfantry units not required for staff positions be made available as infantry replacements. At the same time the War Department cut in half the allotment of basic privates in T/O organizations to release qualified men to the replacement system. Physical qualifications were also relaxed to make more men eligible for combat duty. Replacement depots appointed boards to review the classification of all men previously listed as limited-assignment and recommended the type of assignment for which the men were qualified.75 The first weeks of combat on the Continent were soon to reveal the inadequacy of these measures. OVERLORD three-phase scheme, First Army assembled all data on its requirements through D plus 14, the Advance Section (under the supervision of 1st Army Group) assembled data on the period D plus 15-41, and the Forward Echelon of Communications Zone compiled the requirements for the remainder of the ninety-day period. The assembled requisitions were sent to Headquarters, Communications Zone, the agency responsible for preparing and shipping supplies in accordance with established schedules. them solidly with ammunition, some with engineer supplies, others with ammunition and rations. 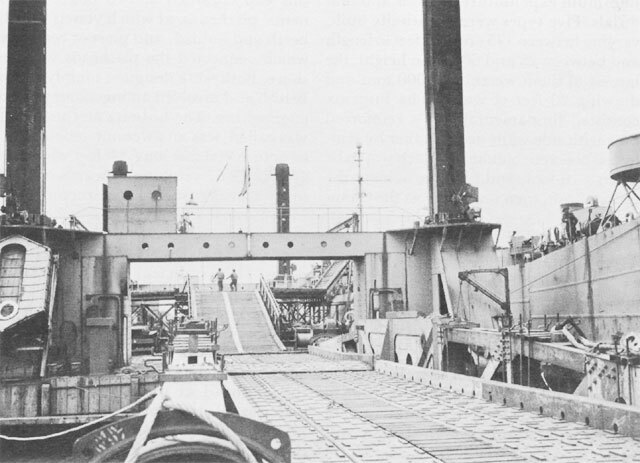 In all cases composition of the cargo was kept as simplified as possible to insure immediate access to needed items and to permit rapid sorting and distribution by the shore brigades.87 Once the supplies were unloaded the coaster fleet was estimated to have a theoretical capacity of 17,000 tons per day, but this was expected to suffer attrition from enemy action and normal marine hazards. From D plus 9 to 21 (called the buildup phase) supply movements were to continue via MT ships and coasters, and a limited number of commodity-loaded Liberty ships were to be dispatched to the far shore. But coasters were to continue as the major carriers in this period. Complete prestowage was expected to end during this phase because of the varying capacity of ships returning from the far shore and because of the impossibility of predicting what ships would be available once the shuttle service began. Instead, tonnages would be consigned to the loading port and the stowage plan determined there by the port commander. Scheduling supply requirements as much as three months in advance, and preloading the first two weeks' shipments, necessarily imposed a considerable rigidity in the entire supply movement program, just as the Buildup Priority Lists did in the movement of personnel. No one could predict with complete accuracy the precise needs of the forces ashore for even a short period. Fully aware of this weakness in the supply plan, logistic planners devised several expedients to achieve a degree of flexibility in the phasing of supplies in the early stages of the operation. They also took special measures to set up emergency reserves as an insurance against interruptions in the flow of supply. supplies on any day. Requests for such substitutions were to allow six days for delivery. The GREENLIGHT procedure was not to become effective until D plus 14. As in the case of Red Ball, priority was to be given in the handling of all such shipments at the depot, in movement to the port, and in dispatch to the Continent. General Moses had even graver misgivings on the subject of the reserve build-up. There appeared to be no question that maintenance requirements could be met satisfactorily, at least in the first six weeks. The difficulty was that tonnage discharge was to be limited in the early phases, principally because port facilities for the reception of large ships would be lacking, and it was therefore impossible to plan for the build-up of large reserves. There was little prospect that the situation would improve after D plus 41. SHAEF planners had estimated that port capacity would reach 45,000 tons by D plus 90, but there was no assurance from the Communications Zone that it would be able to utilize it. The supply build-up, according to General Moses, was expected to be limited to 30,000 tons per day, the tonnage which the Transportation Corps estimated it would be capable of receiving and clearing from the ports and beaches. Receipts at this scale would permit no improvement in the small reserve position in the Communications Zone, and would provide no operational reserves at all for the field forces.95 In the view of the army group G-4 this limitation would create an impossible situation for the Communications Zone. While the prospect was admittedly unfavorable, the logistical planners nevertheless proceeded on the assumption that the administrative situation would be assessed in the early stages of the operation and that changes would be made in the troop build-up lists and planned cargo tonnages if necessary. Assuming that the higher tonnage capacities could be utilized, the planners estimated that reserves would gradually start to build up so that by D plus 90 all the required reserves for the air forces would be established, and 5 units of fire and tonnages equal to about 10 days of supply in the Communications Zone would be available for all troops ashore. But even this build-up would not meet the planned levels, which called for 21 days of supply for all forces in the Communications Zone by D plus 90.
if not impossible. There were many indeterminate factors involved, of course, and, in spite of the gloomy paper prospects at the moment, no immediate changes in plan were contemplated. Hopefully, the G-4 surmised that maintenance requirement estimates might prove excessive, and reserves might be built up from the surplus maintenance brought to the Continent. Progress might also be slower than anticipated, with resulting cuts in supporting and service troops and the creation thereby of greater reserves for the troops ashore. beaches, those figuring most conspicuously being Cherbourg, Ste. Mère-Eglise, Carentan, Valognes, Trévières, La Haye-du-Puits, and St. Lô. Some of these locations were to serve as depots for two or more of the technical services, but most sites were selected for a single specific use, such as third, fourth, and fifth echelon maintenance shops, vehicle assembly plants, Class I storage, or vehicle parks. Since all sites had to be selected on the basis of map reconnaissance it was to be expected that there would be many changes once they were examined. Planning the depot structure involved estimating the amount of space required as well as selecting the most suitable sites. Each service had to calculate its needs for covered and open storage, and, depending on its mission, for covered and open hardstandings, vehicle parks, mmunition storage along roads, and bulk POL tankage. In many cases it was important that storage be located near railway spurs and sidings. The above figures represent the requirements only for the first six weeks, the period during which all supply installations were the responsibility of the Advance Section and all administrative installations of necessity had to be in the Normandy area. After D plus 41 there was to be a noticeable shift, with the main storage and maintenance facilities thereafter concentrated in the Rennes-Laval-Chateaubriant triangle. This shift was to coincide with the change in direction of operations from north-south to east-west as U.S. forces drove into the Brittany peninsula and at the same time east toward the Seine. Important installations were to remain in operation in the base areas, particularly at Cherbourg and St. Lô, but by D plus 90 about two thirds of all storage was to be located in Brittany and farther east.99 Plans for the depot structure, like others, however, were subject to alterations dictated by tactical needs. As events turned out they proved the least stable of all plans and were completely upset by the course of battle. Movements enter into virtually every aspect of supply. No other function does more to make a living organism of the logistic structure. The OVERLORD planners spent long hours on the problem of rail and motor transport on the Continent and suffered strong misgivings in the preinvasion months over the adequacy of their preparations. That the lack of transport could become a limiting factor of critical dimensions was amply demonstrated during the pursuit across northern France in the summer of 1944. Railroads and motor transport, the latter bearing a much greater share of the burden than ever before, were to be the chief carriers on the Continent, as they had been in World War I. In the earliest stages of the operation all movements were to be carried out by truck, and very little rail mileage was expected to be placed in operation before D plus 41. As in the case of the ports, restoring transportation facilities, particularly the railways, was primarily the responsibility of one service--the Corps of Engineers--and operating them was the responsibility of another--the Transportation Corps. The latter had been created as recently as 1942, taking over the operation of motor transport from the Quartermaster Corps and of railways from the Corps of Engineers. Corps with respect to the operation of motor transport was to carry out all motor transportation connected with port clearance, static interdepot operations, and line-of-communications hauling. This entailed traffic regulation, both at the ports and along the lines of communications, and the establishment of regulating stations to control movement into the army areas. For several months after the invasion the Transportation Corps was handicapped by the lack of a centrally controlled motor transport service, although the Advance Section organized a provisional motor transport brigade to provide centralized field control over its own transportation shortly before D Day. Most of the theater's truck companies had actually been activated as Quartermaster units, and many continued to carry the designation "QM Truck Company (TC)" for some months. To accomplish its motor transport mission the Transportation Corps estimated that, in addition to the vehicles furnished the field forces, 240 truck companies would be needed in the Communications Zone, and that two drivers should be provided each vehicle to permit round-the-clock operation. It also requested that a large percentage of the truck units be equipped with the large 10-ton flat-bed semitrailers and truck-tractors. Just before D Day theater headquarters granted the additional drivers, but it had authorized only 160 truck companies for the operation, and only a small percentage of the larger capacity truck-tractor-semitrailer units could be furnished. The smaller 2½-ton 6 x 6 truck had to be substituted. Plans called for moving 130 companies to the Continent by D plus 41. This number of units was expected to meet the daily forward movement requirement of 23,700 tons at that date.102 But there was serious apprehension in several quarters over the adequacy of motor transportation after the first six weeks. Logistical planners at SHAEF noted that the shortage of truck companies was one of the chief factors likely to limit the development of the lines of communications even if operations proceeded as planned,103 and it was this shortage which led General Moses to express misgivings over the prospects of adequately supporting operations after D plus 41. Important as motor transportation was to be in operation OVERLORD, it was not expected to sustain the mounting volume of supply movements after the first few weeks. From the beginning the Allies counted on the railways--a far more economical carrier over long distances--eventually to bear the larger portion of the transportation burden. Restoration of the French rail lines took on added importance in view of the anticipated shortage of truck transport. Lack of a final operational plan made it impossible for a long time to prepare accurate estimates of matériel requirements. Nevertheless, requisitions for special Class IV equipment had to be placed far enough in advance to insure procurement and delivery in time for the operation. Supply planners found it necessary therefore to estimate needs on the basis of hypothetical operational plans, assuming a rail line of communications of a certain length and assuming certain scales of destruction. In all the planning for reconstruction of the continental railways, the engineers maintained close liaison with the Transportation Corps, which organized the 2d Military Railway Service to operate the lines. The 2d MRS was commanded by Brig. Gen. Clarence L. Burpee, who had come into the service from the Atlantic Coast Line. In the early stages of the operation the Railway Service was to be limited primarily to reconnaissance of captured rail lines, and the Corps of Engineers was to determine what alterations in plans, if any, should be made in restoration of lines. To operate the lines the 2d Military Railway Service organized railway grand divisions, intended to handle roughly the area of a base section. A grand division was normally capable of operating from 250 to 450 miles of railway, depending on the number of units assigned to it. For early operations, to D plus 41, the Transportation Corps provided one railway grand division, with two railway shop battalions and two railway operating battalions.109 Not until after this period, however, would operation of the lines become extensive. The magnitude and importance of the movement problem are nowhere better illustrated than in the separate plans which were made for the transportation of petroleum products. Arrangements for POL supply enjoyed a pre-eminence in the planning and preparation for OVERLORD matched only by the plans for port reconstruction. POL alone accounted for one quarter of all the tonnage transported to the European Theater of Operations--a convincing statistical token that gasoline had become the lifeblood of modern armies. Planning for continental POL supply thus got under way at an early date, although definitive plans were long in taking shape. Attempts to requisition materials for a POL distribution system were initially frustrated by the TORCH operation. Experimentation continued, however, not only with an overland pipeline, but with submarine pipelines and ship-to-shore lines. POL planners had much to learn about the handling of equipment and the training and organization of personnel. They attempted to establish sound bases for estimating the POL needs for a continental operation, and found it necessary to requisition enormous amounts of special equipment. Their efforts were partially negated by the lack of a firm troop basis and by the lack of figures on the ratios of vehicles to troops. Nevertheless the later OVERLORD planners profited by the plans and experimentation of the ROUNDUP period. For want of adequate experiential data, the POL planners initially placed considerable reliance on British estimates, particularly for requirements. Estimates as to the earliest date on which POL could be supplied in bulk to the Continent were pessimistic at first. Because all shipping was preoccupied with the movement of supplies and equipment essential to combat operations in the early stages, there was little hope that bulk supply could be initiated before D plus 30.
vehicle-loading pumps and hose. The air forces were interested as the consumer of aviation gasoline, for which special provision had to be made. Co-ordinating the interests and responsibilities of these various parties was a difficult task in view of the initial lack of a single agency for that purpose. POL plans began to assume a clearer outline late in 1943. COSSAC plans at that time called for an intake installation at Port-en-Bessin to receive POL in bulk from tankers in the harbor and via ship-to-shore lines, for storage facilities farther inland, and for a single 4-inch pipeline to St. Lô and Coutances. Contrary to earlier conclusions concerning the availability of tanker shipping for the transport of bulk POL, the COSSAC plans now called for work to begin on bulk installations as early as D plus 5. The initial receiving and storage installations were scheduled to be completed by D plus 10, and the entire line was to be completed by D plus 20. The possibilities of meeting such a schedule were viewed with considerable pessimism until the achievements in the Sicilian operation became known. The Port-en-Bessin installations and inland pipeline were only part of the POL plan developed by the COSSAC planners in 1943. A similar bulk receiving system was contemplated at Cherbourg, and two pipelines were to reach south from Cherbourg along the axis La Haye-du-Puits-Avranches-Laval. They were to be supplemented by additional lines from the Brittany ports inland to Laval. Construction of this system was scheduled to begin immediately after the capture of Cherbourg and was to be completed by D plus 90. Preparing to implement these plans was another matter. Until the end of the year there was no definite basis for figuring the requirements of motor or aviation fuel, which was a prerequisite for sound planning by the Quartermaster Corps and the Corps of Engineers. There was continued lack of co-ordination between the services, and there were not enough men trained for this type of operation. Before adequate planning data were agreed on, confusion, disagreement, overlap of authority, and loss of time attended plans for the establishment of POL sections in the various services and echelons of command. a critical one. Much additional equipment, particularly 6-inch pipe, had to be requisitioned. The fact that much of it had to be obtained from British sources meant some sacrifice of standardization. In the meantime the delivery of construction materials already on order through PROCO requisition was disappointingly slow, and alarming shortages developed as D Day drew nearer. One of the missions of General Moore, chief engineer of the theater, on his trip to the United States in March 1944 was to impress upon the Procurement Section of the Office of the Chief of Engineers the urgency of filling requisitions promptly. In the last months before the invasion there were times when it was very questionable whether enough materials would be available by D Day to carry on the contemplated construction in the first weeks on the Continent. Even the training program for engineer petroleum distribution units suffered from such deficiencies. Shortly before D Day high priorities were given to the shipment of the most urgently needed materials. A survey of the stock status of POL equipment in May revealed that with certain exceptions all items listed as critical by the Advance Section could be supplied for the period up to D plus 14, and it was believed that new stocks arriving in depots would be sufficient to meet requirements from D plus 15 to D plus 41. By 1 June preparations for the POL plan were adequate to meet all the needs of the operation. Problems had also arisen in connection with the proper handling of the materials on hand. Removal of packing lists from boxes often made it difficult to determine the contents of individual crates. POL equipment was scattered over a large area rather than concentrated in one depot; and troops were placed in the depots who were unfamiliar with the nomenclature of items and could not identify articles of equipment. Worse still was the poor care given some of the equipment. Items such as elbows, tees, and valves often lay in the open or were stored in uncovered barrels which collected rain water. Some of these abuses and deficiencies had been noted on inspections in 1943, and corrective measures were taken. These requirements assumed a strength of approximately 67,000 vehicles on the Continent on D plus 14, 183,000 on D plus 41, and 263,590 on D plus 90. To meet their goal, the Allies had to introduce a total of 271,158 tons of POL products in the first 42 days. This included the aviation gasoline (Avgas) requirement, but the bulk of the tonnage (183,233 tons) was allocated to motor vehicle (MT80) gasoline. These amounts would provide a required reserve level of 7 days on D plus 14, 14 days on D plus 41, and 21 days on D plus 90. For the first twenty-one days of the OVERLORD operation all POL needs were to be shipped packaged--that is, in cans. Bulk deliveries were scheduled to begin on D plus 15, although a small percentage of MT80 shipments was to continue in packages in order to build up and maintain the can population on the Continent. While the Minor System was designed to meet the Allies' needs for bulk POL in the initial stages of operation OVERLORD, the biggest share of bulk POL deliveries was eventually expected to be made through the larger and more permanent system based on Cherbourg, known as the Major System. 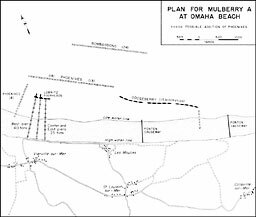 This, like the Minor, was to consist of discharge points, storage facilities, and pipelines, but it was conceived and planned on a much larger scale and, when completed, was to have many times the capacity of the earlier development east of OMAHA Beach. The outstanding features of the Major System were the large discharge capacities at Cherbourg, the long pipelines, and the enormous storage capacities to be developed along the pipeline route. To carry bulk fuel inland plans were made for the construction of three 6-inch pipelines from the Digue de Querqueville in Cherbourg south to Laval and then eastward to the vicinity of Etampes, south of Paris. In addition, tactical conditions permitting, it was hoped that other lines could be built from the Brittany ports, either from Vannes (in the vicinity of Quiberon Bay) to Ch’teaubriant, running northeastward to join the Major System at Laval, or preferably a supplementary line starting at Donges at the mouth of the Loire, and running eastward through Angers, Tours, and Orléans.118 The Advance Section, as the command responsible for detailed plans through D plus 41, made definite plans to extend the lines only to the Brittany area, where the big depots were to be established. Two of these lines were to carry motor vehicle fuel and the third was to carry aviation gasoline. The three lines were to be laid side by side as far as Fougères, a distance of 101 miles. From Fougères a 4-inch branch line (for MT80) was to be extended to Rennes (28 miles) for local distribution. From Fougères southeast two 6-inch lines were to continue to Laval (also 28 miles from Fougères). In addition, by D plus 41 a branch line was to have been started from Laval southwest to Ch’teaubriant, partially for the purpose of connecting with lines from the Loire River ports. 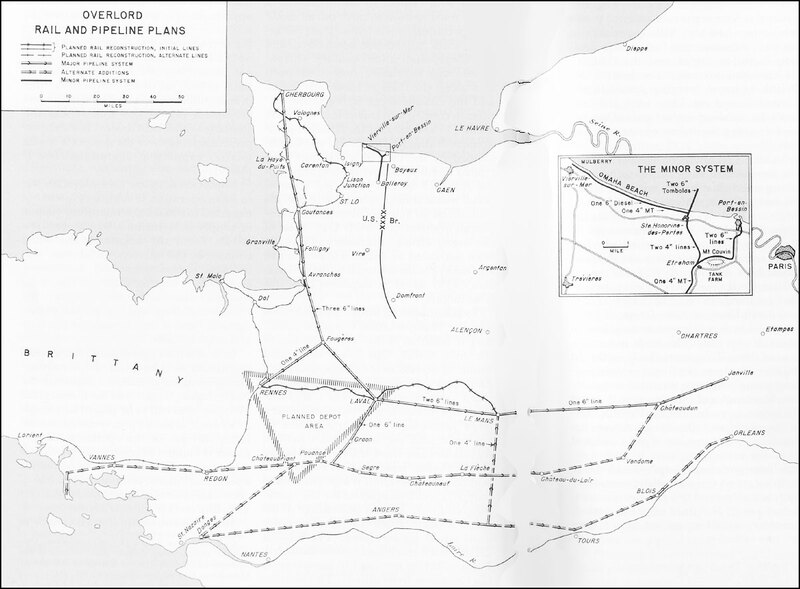 The three 6-inch lines from Cherbourg were to constitute the major pipeline system running to the south and east, and were to carry the major portion of bulk POL projects to U.S. forces. The 6-inch lines had a rated capacity of 1,825 tons per day, and the 4-inch lines a capacity of 825 tons. For planning purposes, however, factors of 1,515 and 650 tons respectively were used. every storage area, consisting of both truck-filling and canning facilities. rate of consumption for each type of vehicle, and an estimated rate of advance. To arrive at estimates of total requirements the planners had to know both the troop and vehicle population on the Continent at different stages. Beyond this fundamental information the ability to construct an adequate POL distribution system on the Continent depended on both the supplies and equipment and the specially trained units which were to be available for such a project. A mass of technical data had to be gathered and applied. The computation of pipeline construction alone involved consideration of all the problems of surveying, clearing the right of way, stringing pipe, connecting joints, installing pump stations, testing and filling the pipeline, building a communications system, and erecting and connecting storage. Assuming that the construction work was completed, the planners still faced a formidable array of computations and calculations. What, they had to estimate, was the capacity of QM units to decant and to distribute? What was the capacity of TC trucking companies to transport? To answer the latter question they had to determine what types of transportation and container--can, drum, tank truck, skid tanks on cargo trucks, or 2,000-gallon trailer trucks--were best suited to various areas in various stages of the operation. How much should they allow for delays from traffic blocks and breakdowns, for interruptions in loading and unloading, for difficulties in locating dumps? What should be the ratios of motor vehicle, aviation, and diesel fuel, of kerosene, and of lubricants; what percentages of reserves should be maintained in package and bulk at various times; what would the turnround time be; what losses of containers should be expected in maintaining an adequate can population? Such matters as draft, port rehabilitation, turn-round time, and loading time entered into the planners' consideration of what type of tankers should be used. To co-ordinate all the facts and the informed guesses and to synchronize the plans of the various services were tasks of almost infinite complexity. They were tasks, however, on which the success of the invasion depended. The very bulk and detail of the OVERLORD logistic plans indicate that the planners were determined that every need should be anticipated, and that no requirement, down to the proverbial nail, should be wanting. The logistic plan was based on a deliberately optimistic forecast of tactical progress to insure a timely build-up of troops and supplies, and to insure that the combat forces should never suffer from want of adequate logistic support. On the other hand, operational plans, including the rate of the troop build-up, were so drawn as to utilize the full potential of the supply organization. The entire plan, therefore, represented an attempt to balance requirements with capabilities. 1. Memo, Army Opns Branch (US) for Head Planners, 4 Oct 43, sub: Secondary Assault on Cotentin Peninsula, SHAEF 381 OVERLORD, I (a). 2. COSSAC Digest of Opn OVERLORD, 15 Jul 43, Annexure I to App. W, SHAEF, COSSAC (43) 28, Opn OVERLORD Outline Plan. 3. The appreciation of July 1943 estimated the capacities of the beaches as 20,000 tons initially, increasing to 30,000 on D plus 3 and 50,000 on D plus 13. These figures were reduced considerably in the more conservative estimates in the final plans. Tonnage requirements, conversely, were later revised upward, totaling 16,500 tons per day for U.S. forces alone by D plus 18. 21 A Gp Study, Subsequent Maintenance of British and U.S Forces-Overlord, 13 Mar 44, SHAEF G-4 Maintenance of British and U.S. Forces 153/2/GDP-I. 4. Rear-Adm. H. Hickling, "The Prefabricated Harbour," The Journal of the Royal United Service Institution, XC (August, 1945), 271. 5. Digest of Opn OVERLORD, pp. 11, 20, and App. U. 6. Comdr. Alfred B. Stanford, Force MULBERRY (New York, 1951), p. 40. 7. [Clifford L. Jones] NEPTUNE: Training for and Mounting the Operation, and the Artificial Ports, Pt. VI of The Administrative and Logistical History of the ETO, MS (hereafter cited as NEPTUNE: Training for and Mounting the Operation), II, 110, OCMH. 8. Digest of Opn OVERLORD, App. X, Annexure to App. X, and sketch SX, atchd. 9. Rpt by Combined Adm Com, CCS, 2 Sep 43, sub: Artificial Harbors for Combined Opns, CCS 307/2, SHAEF G-4 825.1 MULBERRY I 44. 10. Memo, Maj Gen G. R. Turner for Lt Gen A.C.G. McNaughton, 10 Aug 42, SHAEF SGS 800.1 MULBERRY I. 11. Rpt by Combined Adm Com, 2 Sep 43. 12. See photograph, p. 414. 13. Rpt of Combined Adm Com, 2 Sep 43; Hickling, op. cit., pp. 274-75. 14. Hickling, op. cit., p. 275; Stanford, Force MULBERRY, p. 66. 15. Annex to note by Secy Jt Stf Mission to COS Com, 12 Sep 43, sub: Artificial Harbors for Combined Opn, COS 529/0, SHAEF SGS 800.1 MULBERRY I. 16. CM&SF Monthly Progress Rpt 5, for Dec 43, 7 Jan 44, COS (44) 17 (0), SHAEF SGS 800.1 MULBERRY I. 17. Rpt by Combined Adm Com, 2 Sep 43. 18. Ltr, Brig Sir Harold Wernher to COSSAC, 21 Oct 43, sub: MULBERRY, COSSAC/CMSF/67, SHAEF AG 820-1 Artificial Harbors. 19. Hickling, op. cit., pp. 273-74. 20. Ltr, Brownjohn to Cots SHAEF, 24 Jan 44, sub: MULBERRY Stf Requirement, SHAEF G-4 825.1 MULBERRY I 44; Incl to Ltr, Wernher to Secy of Admiralty, 12 Jan 44, sub: MULBERRY--Stf Requirements, COSSAC/CMSF/ 181, SHAEF SGS 800.1 MULBERRY I. See also Initial Joint Plan, and NEPTUNE: Training for and Mounting the Operation, I. 138. 21. Rpt of Combined Adm Com, 2 Sep 43, p. 6. 22. NEPTUNE: Training for and Mounting the Operation, II, 115. 23. By December 1943 the rubber-type BOMBARDON had been abandoned. Meanwhile two of the steel cruciform prototypes had broken their backs in a half gale, and measures had to be taken to strengthen the remaining units under construction. CM&SF Monthly Progress Rpt 5, for Dec 43, 7 Jan 44, SHAEF SGS 800.1 MULBERRY I. 24. Sir Frederick Morgan, Overture to Overlord (Garden City, N. Y., 1950), pp. 263, 264-65. 25. Memo, Capt C. R. Johnson, USN, for Jt Log Stf Com ETOUSA, 15 Dec 43, sub: US. MULBERRY A Progress to 15 Dec 43, EUCOM 334 Jt Log Stf Com I; Ltr, J. W. Gibson, Ministry of Supply, to Brig Wernher, 29 Nov 43, SHAEF AG 820-1 Artificial Harbors; Rpt on MULBERRY A, prep by Capt Clark and Col John R. Hardin, Deputy Chief Engr, 15 Jan 44, ETO 800.1 Harbors; Ltr, G. W. S. Friedrichsen to author, 21 Sep 51, giving data on planned construction provided by Hist Sec, Cabinet Offices, OCMH. 26. Note by Jt Parliamentary Secy, Ministry of Supply, 30 Jan 44, COS (44) 103 (0), SHAEF AG 820-1 Artificial Harbors, 2. 27. Memo, Johnson for Jt Log Stf Com, 15 Dec 43; Note by Jt Parliamentary Secy, Ministry of Supply, 30 Jan 44. 28. NEPTUNE: Training for and Mounting the Operation, II, 116. 29. Ltr, Morgan to Secy COS Com, 21 Jan 44, sub: MULBERRY and GOOSEBERRY, Annex, SHAEF SGS 800.1 MULBERRY I; Rear Adm H. Hickling and Brig I.L.H. MacKillop, Story of the Mulberries, MS, and Ltr, Friedrichsen to author, 21 Sep 51, OCMH. 30. Ltr, Ministry of Production to Secy COS Com, 25 Apr 44, sub: Provision of Artificial Harbors, COS (44) 370 (0), SHAEF SGS 800 MULBERRY I. 31. Stanford, Force MULBERRY, Ch. VII. 32. TWX, ANCXF to SHAEF et al., 2 Jun 44, SHAEF G-4 825.1 MULBERRY II 45. 33. Ltr, Gale to COfS ANCXF, 9 Mar 44, sub: Construction of MULBERRIES, SHAEF SGS 800.1 MULBERRY, Case A; Ltr, Smith to Secy COS Com, Mar 44, sub: Construction of MULBERRIES, and Min of Mtg, I7 Mar 44, to consider means to prolong life of MULBERRIES into winter months, 21 Mar 44, Office of ANCXF, X/091/14, SHAEF SGS 800.1 MULBERRY I. 34. See below, n. 48. 35. FUSA Opns Memo 5, 13 Feb 44, in Operation Report NEPTUNE, OMAHA Beach, prep by Hist Sec ETOUSA, Sep 44, p. lxiii OCMH. 36. NEPTUNE: Training for and Mounting the Operation, I, 141-42; Operation Report NEPTUNE, OMAHA Beach, App. A (Troop List), App. C (Jt Agreement between CG FUSA and Cmdr Task Force 122 for Amphibious Opns), and App. D (FUSA Opns Memo, 5, Engr Special Brigades Reinforced), OCMH. 37. FUSA Rpt of Opns, 20 Oct 43 to 1 Aug 44, Annex 11 (ESB Plan), Bk. IV, p. 26. 38. Communications Zone Plan, issued by Hq FECOMZ, 14 May 44, Sec. XII, ETO Adm 376. 39. Ltr, Davison to CofS ETOUSA, 13 Jul 42, cited in Port Construction and Repair, Hist Rpt 11, Corps of Engrs ETO, p. 4, ETO Adm.
40. Ibid., pp, 10-11. These were Barfleur, Binic, Brest, Cherbourg, Cancale, Concarneau, Grandcamp, Granville, Isigny, Le Croisic, Le Pouliguen, Lorient, Morlaix, Quiberon Bay, St. Brieuc, St. Malo, St. Nazaire, and St. Vaast. 41. Engr Rpt 11, pp.11, 16. 42. ADSEC NEPTUNE Plan, 30 Apr 44, Annex 6 (Engrs), ETO Adm 377. 43. Sources for these figures are: FUSA NEPTUNE Plan, App. I to Annex 1 1 (ESB Plan), in FUSA Rpt of Opns, 20 Oct 43-1 Aug 44, Bk. IV, p. 46; ADSEC Engineer Plan; COMZ Plan, App. N and Annex 13 (TC). 44. ADSEC Plan, Annex 6 (Engrs), App. A (I), Six Minor Ports; Engr Rpt 11, Ch. III. 45. ADSEC Plan, Annex. 6 (Engrs). 46. COMZ Plan, App. N.
47. ADSEC Plan, Annex 6 (Engrs), App. A (I), Six Minor Ports. 48. A "major port" consisted basically of a port headquarters and headquarters company and a varying number of port, truck, and amphibian truck companies, but it usually also had many special units. The 11th Port, for example, consisted of a headquarters and headquarters company, 12 port companies, 11 QM service companies, 6 QM truck companies (TC), 3 amphibian truck companies (DUKWs), an ordnance medium automotive maintenance company, a port signal company, a harbor craft company, and a finance disbursing section. Operation Report NEPTUNE, App. A. 49. ADSEC Plan, Annex 14 (TC). 50. Cherbourg--Gateway to France: Rehabilitation and Operation of the First Major Port, prep by Hist Sec ETOUSA, 1945, MS, p. 5, OCMH. 51. ADSEC Plan, Annex 6 (Engrs), App. A (11). 52. ADSEC Plan, Annex 13 (TC). 54. Col. S. A. Potter, Jr., "Quiberon Bay," Military Review, XXXI (September, 1951), 45-53. 55. Memo, 2 I A Gp Plans, 13 Mar 44, sub: Subsequent Maintenance of British and U.S. Forces--OVERLORD, SHAEF 12 A Gp 400.402 Maintenance, Equipment, and Supplies. 56. The port capacities as estimated in the COMZ plan in May were apparently adequate to meet the needs of U.S. forces. However, the records contain many conflicting figures on the whole subject of port capacities and their estimated capture and opening dates, and there were many changes in these estimates between the time of the OVERLORD estimates of July 1943 and the final COMZ plan of May 1944. In no one place are enough figures gathered together on the estimates of U.S. tonnage requirements and port capacities to justify comparisons and conclusions as to the adequacy of the port plans for any one date. The table figures are based on the COMZ Plan, Appendix N, with the following exceptions: estimated opening dates and tonnages for the beaches and minor ports through D plus 20 are from the more conservative FUSA figures in Annex 1 1 , Appendix I of the FUSA NEPTUNE Plan. Data for the period D plus 21 to D plus 41 are from ADSEC Plan, the remainder from COMZ TC plan and Appendix N of the COMZ Plan. The general practice followed has been to accept the plans of the headquarters which was responsible for the particular period: FUSA for the early period; ADSEC for the intermediate phase to D plus 41; and COMZ for the subsequent period to D plus 90. 57. Memo, Vaughan, CG FECOMZ, for C-in-C 21 A Gp, 1 Jun 44, sub: Delay in Capture of WATSON, SHAEF 12 A Gp 825 WATSON. 58. COMZ Plan, Sec. VI (Troops); The Control of the Buildup of Troops in the Cross-Channel Amphibious Operation OVERLORD, Gen Bd Rpt 22, pp. 3-4. 59. Airborne units are not included in these figures. 60. FUSA Rpt of Opns, Bk. II, p. 142, for period D to D plus 14. Figures for D plus 15 to D plus 90 are from COMZ Plan, Sec. VI (Troops), and do not include 204,800 replacements. 61. COMZ Plan, Sec. VI (Troops). 62. The term field forces rather than ground forces is used throughout the plans to refer to all forces in the combat zone, and included service units with the combat commands. 63. The term "division slice" is used to express the relationship between the total theater strength and the number of divisions supported, and represents the total number of men involved in maintaining a division in the field. It is determined by dividing the theater strength (minus air forces) by the number of divisions in the theater. The normal division slice of 40,000 was made up as follows: 15,000 in the division itself, 15,000 corps and army troops, and 10,000 COMZ troops. 64. Min of Supreme Comdr's Conf, 24 Jan 44, SHAEF SGS 337/11 Supreme Comdr Conf. 65. Adrn Stf Study 1 1 , G-4 SHAEF, 3 Jun 44, sub: Logistical Situation U.S. Forces D plus 41-D plus 90, SHAEF 12 A Gp 370 SHAEF Plans, Adm Stf Studies. 66. Ltr, Col Hugh Cort, CofS ADSEC, to Deputy CG COMZ, FECOMZ, 27 May 44, sub: Effect of New Phasing of Opn NEPTUNE on COMZ Plan, EUCOM 381 NEPTUNE, I; Rpt, 21 A Gp to G-3 SHAEF, 4 Jun 44, sub: Status of Plng, SHAEF G-3 GCT Ops 'A' 21 A Gp--General; Ltr, Plank, CG ADSEC, to DCofS FECOMZ, 26 May 44, sub: Changes in Tactical Plan FUSA, 12 A Gp 370 Planning--ADSEC; ADSEC Operations History, p. 23, ETO Adm.
67. Control of the Buildup, Gen Bd Rpt 22, p. 5; FUSAG Alternative Troop Priority List B, Tentative, 18 June 44, EUCOM Jt Opns Plan--Alternative Troop Priority List B, FUSAG. 68. The Procurement and Use of Manpower in the European Theater, Pt. IX of The Administrative and Logistical History of the ETO (hereafter cited as Procurement and Use of Manpower), p. 17, OCMH. 69. FUSA Rpt of Opns, Bk. II, p. 181. 70. COMZ Plan, Annex 23 (Replacement Plan). 71. Ltr, Hq ETO to CG FUSA, 30 Mar 44, sub: Simplified Combat Replacement Procedures, and 1st Ind, FUSA to CG ETO, 8 Apr 44; Memo, Chief Field Force Replacement System for AG Classification Div, 10 Apr 44; Memo, AG Replacement and Classification Div for G-1, 21 May 44, sub: Package Shipments of Replacements; Memo, Col R.L. Gillespie, Ex O Replacement System, for G-1 ETO, 3 Jun 44. All in ETO GFRC 370.092 Reinforcements May 44 to Apr 45. Procurement and Use of Manpower, pp. 30-33; History of the Ground Force Replacement System, ETO, Pt. I, Ch. III, ETO Adm 571. 72. Procurement and Use of Manpower, pp. 43-47. 74. The History of the 12th Army Group, March 1945, draft MS, I, 205, SHAEF 12 A Gp 370.2; Cbl 4335, Marshall. 75. Procurement and Use of Manpower, pp. 60-64; Ltr, WD AG to CG ETO, 23 May 44, sub: Reduction of Basic Privates in T/O Units, ETO GFRC 200.3 Personnel Requisitions, File B. 76. Rpt, T. S. Riddell-Webster to COS Com, War Cabinet, n. d., SHAEF SGS 370.01 Rate of Build-up for Continental Opns; Memo, 21 A Gp (Plans), 15 Mar 44, sub: Build-up Policy, and Brief for CofS 1 A Gp, for Mtg, 15 Mar 44, SHAEF 12 A Gp 370 Build-up, Dec 43 to Mar 45. 77. The term "day of supply" is defined as the estimated average daily expenditure or consumption of an item, normally figured on the basis of pounds per man per day. It is used mainly for procurement purposes and in expressing the level of supply reserves in a theater or its major subdivisions. The term "unit of fire" was an additional unit of measure for ammunition (Class V) supply. It was used for tactical purposes only, either to indicate stock levels in army depots, or as a means of specifying the expenditure of ammunition permitted in the initial stages of an operation, and represented specified numbers of rounds of ammunition per weapon, varying with the types and calibers of weapons. For the 105-mm. howitzer, for example, it was 125 rounds, for the 155-mm. howitzer, 75 rounds, and for the 8-inch howitzer, 50. The two terms are not synonymous, and a unit of fire cannot be translated into days of supply. The former was abandoned as a yardstick after the war. 78. Except for antiaircraft ammunition, which would be built up to 7 units. 79. Ltr, FUSAG to CGs FUSA, TUSA, et al., 19 Apr 44, sub: Allocation of Tonnages, SHAEF 12 A Gp 370.2 FUSAG Allocation of Tonnages. 80. Draft Memo, 21 A Gp, Mar 44, sub: Subsequent Maintenance of British and U.S. Forces-OVERLORD, SHAEF 12 A Gp 400.402 Maintenance, Equipment and Supplies. 81. COMZ Plan, App. L; Ltr, FUSAG to Armies, 19 Apr 44, sub: Allocations of Tonnages; Jt Adm Plan, 19 Apr 44; Mechanics of Supply in Fast Moving Situations, Gen Bd Rpt 27, p. 18. 82. Adm Stf Study 11, G-4 SHAEF, 3 Jun 44, sub: Logistical Situation U.S. Force, D plus 41-D plus 90, SHAEF 12 A Gp 370, SHAEF Plans, Adm Stf Studies. 83. Adm Appreciation, G-4 SHAEF, 17 Jun 44, sub: Post-NEPTUNE Opns, SHAEF 21 A Gp 370.2 Adm Appreciation Post-NEPTUNE Opns. 84. 12 A Gp Rpt of Opns, Bk. VI (G-4), p 16; FUSA Rpt of Opns, Bk. I, pp. 31-32, Bk. V, pp. 139-40. 85. Mounting the Operation OVERLORD, Gen Bd Rpt 129, p. 18. 87. Ltr, Brownjohn to CAO, 26 Mar 44, sub: Emergency Supply, SHAEF G-4 400 Supplies, General, II. 88. Hq SOS, Opn OVERLORD Supply Movement (U.S.) Instructions, 6 May 44, EUCOM 381 OVERLORD, Supply Movement; Mounting the Operation OVERLORD, Gen Bd Rpt 129, pp. 12-17. 89. Not to be confused with the Red Ball motor transport express later established on the Continent. 90. FUSA Rpt of Opns, Bk. V, p. 140; Mounting the Operation OVERLORD, Gen Bd Rpt 129, p. 14; 1st Ind, Stratton to U.S. Adm Stf at 21 A Gp, 15 Jun 44, EUCOM 400.22 Shipments General, I. The Red Ball procedure was specified in ETO SOP 8, the GREENLIGHT procedure in SOP 41. 91. FUSA Rpt of Opns, Bk. V, p. 140. Procedure for air supply was laid down in ETO SOP 9. 92. A landing barge which could carry either supplies or vehicles and could be beached. 93. Ltr, Brownjohn, Deputy G-4 SHAEF, to CAO, 26 May 44, sub: Emergency Supply, SHAEF G-4 400 Supplies, General; FUSA Rpt of Opns, Bk. V, pp. 139-40. The barges were requisitioned from the United States in the spring of 1944 and were towed to the United Kingdom by large tugs. 94. Ltr, Moses to G-4 ETO, 20 May 44, sub: Control of Supply Build-up, with 1st Ind by Lord, 1 Jun 44, and Stf Study by Col G. S. Speidel, G-4 FECOMZ, 21 May 44 sub: Control of Supply Buildup--In Answer to Inquiry of Deputy MGA, 21 A Gp, EUCOM 400 Supplies, Services and Equipment, General, IIIB; Draft 1st Ind, Stratton to C-in-C 21 A Gp for US. Adm Stf, 15 Jun 44, EUCOM 400.22 Shipments General, I. 95. Operational reserves are defined as supplies held by an army to insure continuity of distribution and issue to its subordinate elements. 96. Memo, Moses to CofS FUSAG, 16 May 44, sub: OVERLORD Supply Situation, D plus 41-D plus 90, SHAEF 12 A Gp G-4 Memos 1944. 97. Ltr, FUSA to Stf Secs and Svcs, 23 May 44, sub: Control of Beach Area Dumps, FUSA 370 Employment and Opn of Troops, FUSA-16, Drawer 4. 98. ADSEC NEPTUNE Plan, technical service annexes. 100. Road Maintenance and Highway Bridging, Hist Rpt 14, Corps of Engrs ETO, Ch. I, ETO Adm; ADSEC NEPTUNE Plan, Annex 6 (Engr), App. D.
101. ADSEC Plan, Annex 6 (Engr), App. D.
102. ADSEC Plan, Annex 14 (Transportation); Operation, Organization, Supply and Services of the Transportation Corps in the European Theater of Operations, Gen Bd Rpt 122, pp. 42, 99-100. 103. Ltr, Chief Log Plans Br G-4 SHAEF to G-4 SHAEF, 17 Apr 44, sub: Log Plans Progress Rpt 7, SHAEF SGS 3 19.1/4 G-4 Rpts. 104. Railroad Reconstruction and Bridging, Hist Rpt 12, Corps of Engrs ETO, p. 21, ETO Adm.
106. ADSEC Plan, Annex 6 (Engr), App. C.
107. Engr Rpt 12, pp. 25-26. 109. Military Railway Service, Gen Bd Rpt 123, pp. 4, 11. 110. Petroleum, Oil and Lubricants, Hist Rpt 13, Corps of Engrs ETO, pp. 3-6, ETO Adm.
111. Interv with Col. Elmer E. Barnes, former Chief Petroleum Officer ETO, 20 Feb 50; Ltr, Burford to author, 3 Apr 50, OCMH. 112. See COMZ and ADSEC Plans, with Engr, QM and TC annexes and App. P (POL) to the COMZ Plan. The above is based primarily on Historical Report 13 of the Corps of Engineers, ETO. 113. COMZ Plan, App. P. These figures are mixed net and gross--gross in the case of packaged, net in the case of bulk tonnages. 114. ADSEC Plan, Annex 6 (Engrs); Engr Rpt 13, Ch. II. 115. Ltr, Devers to Stark, Cmdr US. 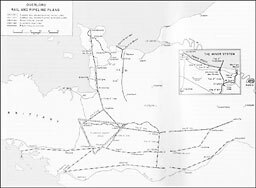 Naval Forces in Europe, 16 Dec 43, sub: Cross-Channel Submarine Pipeline, and Cbl WL-2729, Lee to AGWAR, 16 Dec 43, ETO AG 678 Pipelines; Engr Rpt 11, pp. 31-33. 116. ADSEC Plan, Annex 6 (Engr). 118. COMZ Plan, App. P.
120. ADSEC Plan, Annex 6 (Engr). 122. Ltr, Col Cort, CofS ADSEC, to Deputy CG COMZ, 27 May 44, sub: Effect of New Phasing of Opn NEPTUNE on COMZ Plan, SHAEF 12 A Gp 370 Plng-ADSEC. 123. Rpt of conf of adm officers, 12 A Gp, 26 May 44, 12 A Gp G-4 Ltrs, Memos, Assorted 1944; Rpt on conf to discuss alterations in POL plan, 29 May 44, SHAEF 12 A Gp 337 Confs and Mtgs, VI; Ltr, Vaughan to U.S. Adm Stf at 21 A Gp, 1 Jun 44, sub: Delay in the Capture of WATSON, USFET 381 Opns Documents. 124. Ltr, Chief Log Plans Br G-4 SHAEF to G-4, 17 Apr 44, sub: Log Plans Progress Rpt 7, SHAEF SGS 3 19.1/4 G-4 Rpts. 125. Adm Stf Study 11, Log Plans Br, G-4 SHAEF, 3 Jun 44, sub: Logistical Situation U.S. Forces D plus 41-D plus 90, SHAEF 12 A Gp 370 SHAEF Plans, Adm Stf Studies.